He gives a few tips in his Maryland drawl—pivot your body; get the end of the line movin’; don’t watch what you’re doin’; just straight away, straight back—and then, with a few swift movements, jets his arm forward and gracefully drops the tip of the line exactly where he wanted it to go. “It’s that simple,” he says, as my palms begin to sweat. 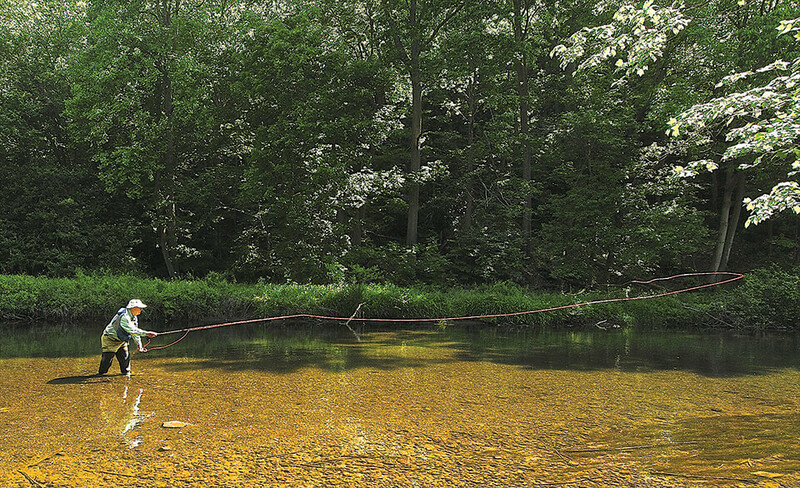 Fly-fishing is simple, but then again, this is Lefty Kreh, the man who reinvented it. This is the man who took the staid, centuries-old sport of blue bloods past and freed it up into an art form fit for every man, and every woman, too. With a shift of his hips, he transformed the fixed formality of a fly-cast into a fluid extension of the angler—no longer a stiff mechanical motion but now an artist’s brush and his strokes of paint. Five-foot-six with sky-blue eyes and a hearty laugh, this is the man who, from the streets of small-town Frederick, the depths of the Great Depression, and the trenches of World War II, became the world’s best fly-fisherman. He has thrown line in every U.S. state, every Canadian province, and too many countries to count. He has caught over 100 species of fish and wet hooks with scores of celebrities, presidents, and CEOs who vie for his knowledge and time, from Ted Williams and Tom Brokaw to Jimmy Carter and George H.W. Bush. Ernest Hemingway and Fidel Castro in one weekend. Ninety-one years ago, out of our very own backyard, a legend was born. And yet, with the charm of a good ol’ boy and familial spirit of a long, lost friend, Lefty Kreh would never let you know it. To him—“a guy from Frederick, Maryland, with no more than a high school education,” as he so often puts it—it has just been a lucky life. Before Baltimore had skyscrapers, or the bay had bridges, or highways spread like tributaries across the state, Lefty was born Bernard Victor Kreh in Frederick in 1925. At that time, Charlie Chaplin was the biggest star in Hollywood and Jack Dempsey was heavyweight champion of the world. Calvin Coolidge was president, the Roaring Twenties were in full swing, and The Great Gatsby was about to hit shelves. But a few years later, his father died, having been kicked in the chest during a basketball game, leaving behind a young wife and four small kids at the height of the Great Depression. “In the 1930s, nobody had any money, and here was my mother, all alone with four children,” says Lefty, who was 6 at the time. “But she was very prideful, tougher than an automobile tire, so she wasn’t going to give us up.” Instead, as part of FDR’s New Deal Program, the family went on “relief” and was allotted a small house on North Bentz Street in a poor black community. It was there that Lefty became “Lefty,” as kids from the neighborhood knighted him the nickname, a scrappy little southpaw with a knack for sports. By the time he was 12, Lefty had two options: school or work. “We didn’t have no money, but my mother said if I could make enough to get myself clothes and lunch, I could go to high school.” Education was a privilege, so Lefty got busy. “When a mussel moves along the river, it leaves a little track in the mud, so some friends and I would spend all day pickin’ ’em up, puttin’ ’em in a little backwater, and huskin’ ’em out like oysters,” Lefty says. In the evening, he’d build a fire, cook hot dogs, and hang strands of mason twine to tree limbs that dangled over the riverbank. At the end of the line was a hook, and on the end of that hook was one of those mussels. “The catfish would swim the banks at night and the limbs would act like fishin’ rods,” Lefty says. So twice a night with kerosene lanterns, he’d pole along the water and pick off his daily catch. 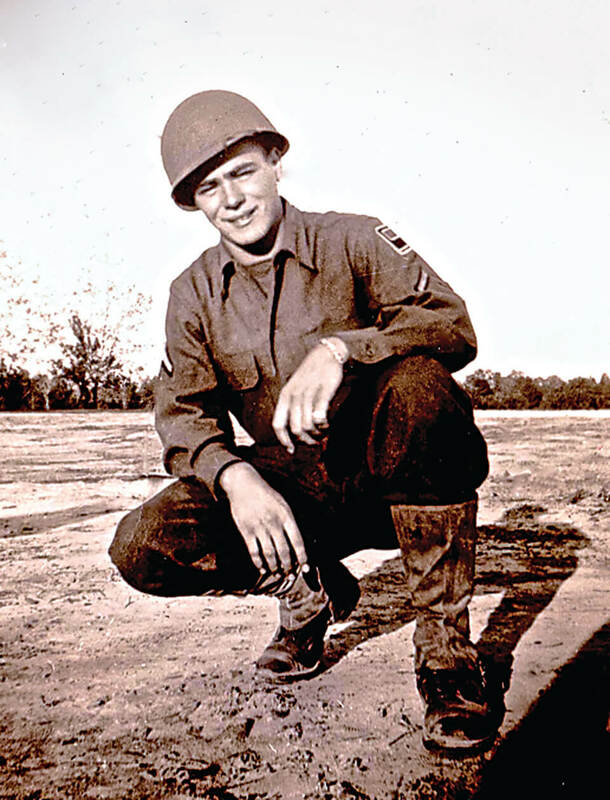 Lefty as a young soldier in Europe during World War II. In August 1945, the 20-year-old serviceman was sent home for a 30-day furlough, expecting to then head onto the Pacific. “I was walkin’ down the streets of Frederick, when all of a sudden, sirens started goin’ off. Women came runnin’ outside, blowin’ kisses and dancin’ around. Cars were honkin’ their horns.” We had dropped the atom bomb. 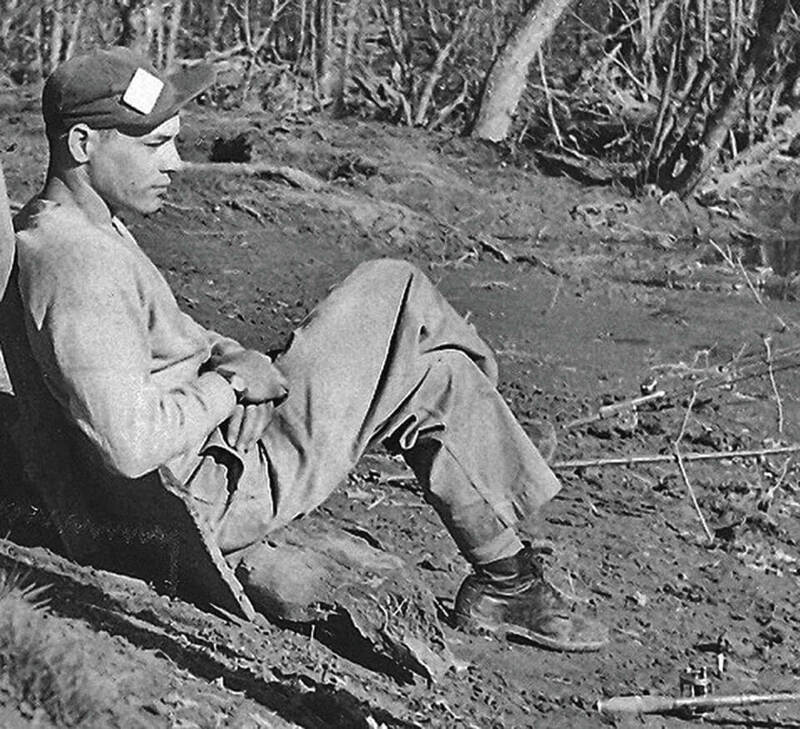 As a shift worker, Lefty often worked nights, which freed him up to hunt and fish all day. In no time, he started to gain a reputation for being “the hotdog bass fisherman of Central Maryland,” he says. “People thought I was some hotshot, but the fish didn’t think so.” But Lefty was rigging bait here, and tweaking lures there, and soon enough, he caught the attention of a local reporter named Joe Brooks. The next day, Lefty hopped in his Model A Ford and drove down old Route 40 to a small fishing shop called Tochterman’s. There, on Eastern Avenue, he bought a Pflueger Medalist reel and South Bend fiberglass rod, then followed Joe Brooks to Herring Run Park for his first fly-casting lesson. But Lefty and the fly rod were not fast friends. Perfecting his cast was a slow, arduous process. But he practiced and practiced and gradually started to develop his own way of doing things. To him, the tried-and-true casting method was, simply put, inefficient. For centuries, fly-fishermen had been moving nothing but their forearm, ticking between 10 and 2 like a metronome pendulum. “It just didn’t make sense to me,” he says. “Fly-fishermen were immobile, just usin’ their wrist and arm. They’d been doin’ what the English taught them hundreds of years before and hadn’t changed a thing. But you use the rest of your body, even when playing Ping-Pong.” So he decided to put his hips into it. 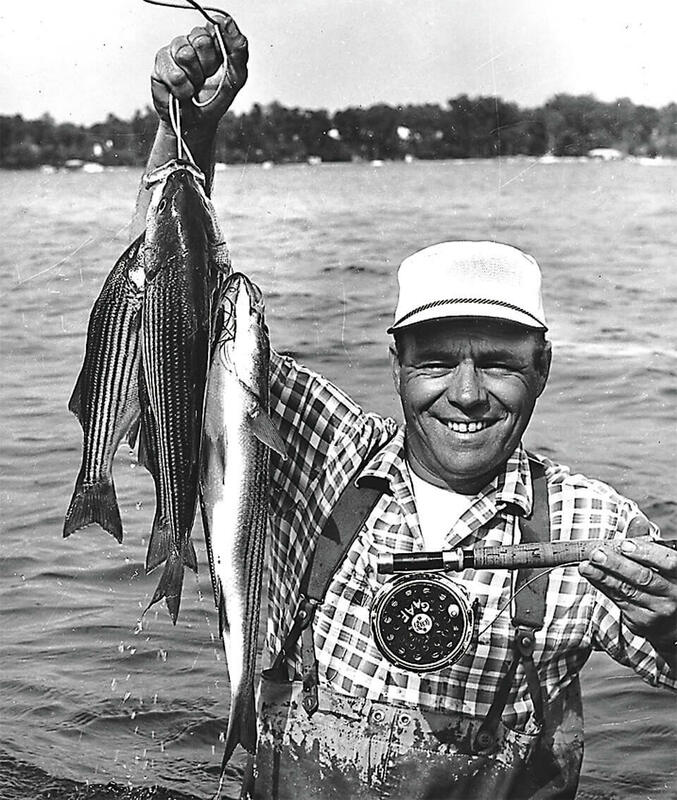 Lefty catches rockfish on the Severn River with his first fly reel and rod in 1955. To this day, Lefty calls Ev, who passed away five years ago, the greatest woman there ever was and his marriage the best there’s ever been. “She was about this big”—gesturing toward five feet high—“and you didn’t piss her off,” he says with a wink. “But we got along crazy, we really did.” The couple rented a house on West Patrick Street and eventually had two children—Victoria, nine months to their wedding day, and Larry, three years later, who fished with Lefty every weekend. His writing career actually began at the Frederick News-Post in 1951. He was still working eight-hour days at Fort Detrick and didn’t know much about writing, but he knew what to write about. With firsthand experience and matter-of-fact diction, his how-to “Maryland Afield” columns took off, and the next thing he knew, he was writing for the Towson County Paper, Montgomery County Sentinel, and Virginia’s Winchester Star. “At the time, my wife and I didn’t have enough money to buy a mosquito underwear,” Lefty cracks, “so I was lookin’ for other sources of income.” He also took a liking to photography, eventually working with big names like Leica and Nikon and even becoming a photo consultant for L.L. Bean. But still, with the energy and appetite of a young man in his early thirties, Lefty got to thinking: What if he could give his readers advice outside of the Old Line State? What if he could travel the country, give quick clinics at local outdoor clubs, and then find the “best damn fisherman in town” to teach him their waters and ways? Before long, he was getting invitations from all over the world. Today he can tell you where to find the best trout streams in England or what to use for barramundi in Australia or how to catch Atlantic salmon on the Alta River near the Norwegian Sea. 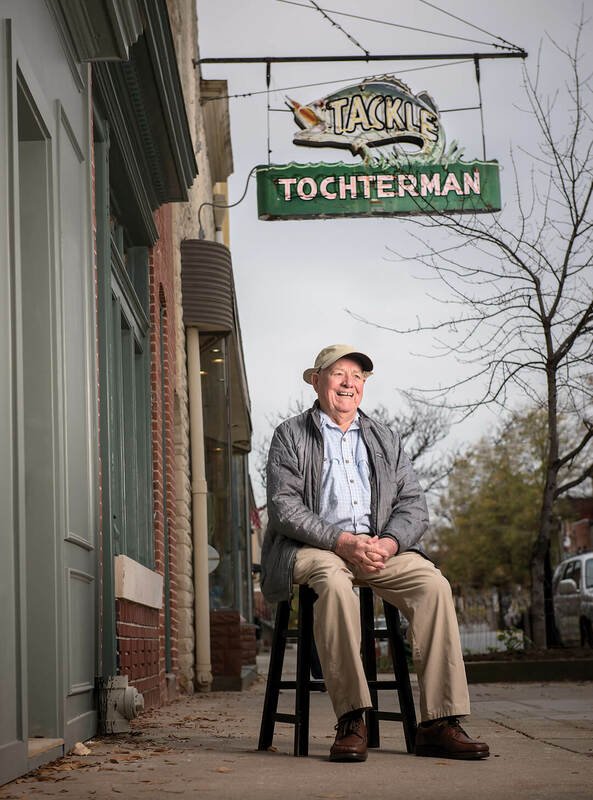 “I’ve had customers from Russia, Asia, Saudi Arabia, all the way through South America, and everybody knows the Lefty’s Deceiver,” says Tony Tochterman, owner of Tochterman’s tackle shop and son of Tommy Tochterman, who sold Lefty his first fly outfit. Since then, Lefty has also designed his own rods and developed fishing lessons to live by through 31 books. He’s currently working on number 32. And truly, he was. Over the course of his lifetime, Lefty has fished everywhere from the Chesapeake Bay and Rocky Mountains to Iceland and the Amazon. He tells stories about Christmas Island, the world’s largest atoll, 100 miles around, just brimming with bonefish. About trips to New Guinea, where he gave M&Ms to natives and bought watermelons out of dugout canoes. About campfires with anthropologists in the outback of Australia—“at night, the stars are unbelievable”—and about catching the biggest damn snook he ever hooked in Belize. Lefty’s tales transport you like a childhood bedtime story, full of characters and adventure, mishaps and good fortune, hearty punch lines and good-intentioned hyperbole. They’re part campfire yarn, part Big Fish, and as he tells them, you can see the pure delight in the pull of his cheeks and creases of his eyes. Like, this really happened! Like, can you believe it? Like he still can’t himself. He’ll tell you about his friendship with baseball legend Ted Williams, who would “piss and moan” whenever Lefty wouldn’t eat his fancy French food. (“I don’t eat nothin’ but four colors, and they gotta be well done.”) He’ll talk about the day after a Missouri rainstorm when he helped golf pro Jack Nicklaus fine-tune his cast. (“He was grinnin’ like a Halloween pumpkin.”) He’ll show you pictures of him and country music star Jimmy Dean. Lefty loves women, too. Not in any romantic sense—he had the best woman in the world, remember—but he respects them, thinks they’re “smart as hell,” and feels cool as a clam in a room full of them. Fly-fishing has been a long-established boys’ club, but Lefty’s excited to see more and more females joining the sport. “He’s a real champion of women, doesn’t have a mean bone in his body, and is generous to a fault,” says Candy Thomson, public information officer at the Maryland Department of Natural Resources, who Lefty staunchly supported when she became outdoors editor at The Sun in 2000. 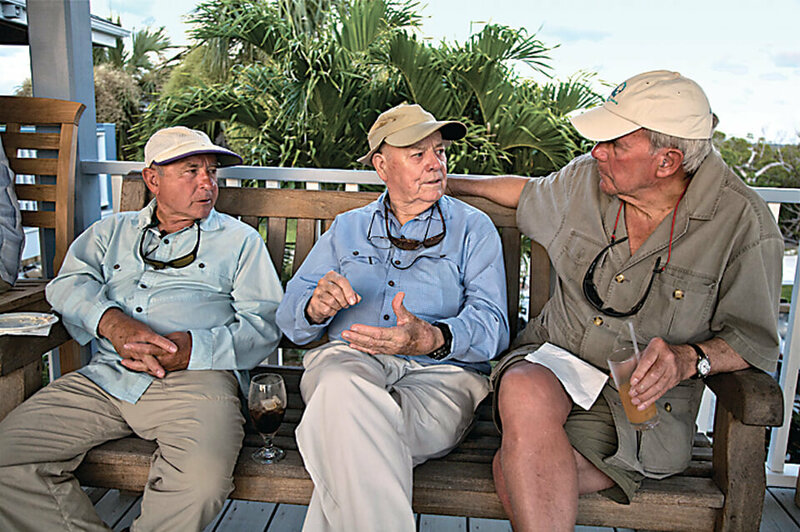 Patagonia founder Yvon Chouinard, Lefty, and former NBC Nightly News anchor Tom Brokaw in the Bahamas. 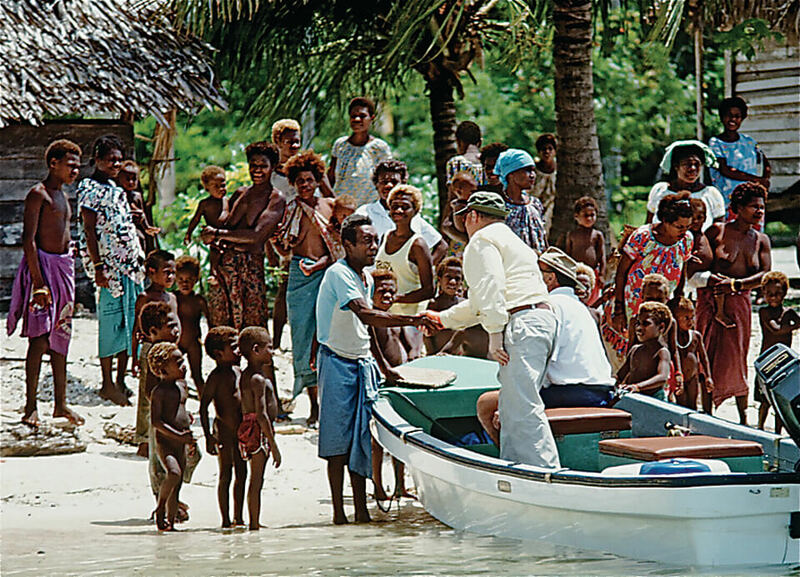 Lefty greeting people in New Guinea. Lefty on the banks of the Monocacy River in the early 1950s. Lefty and his wife, ev, in their cockeysville home in mid-2000s. 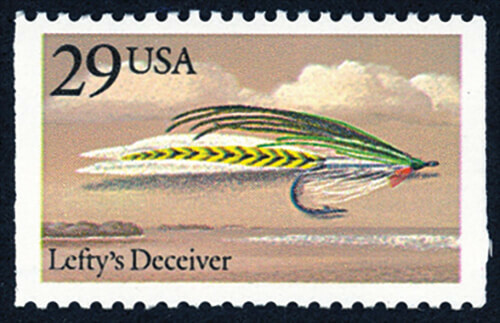 The Lefty’s deceiver stamp, created in 1991. But he’s not ready to give up: His casting legacy and conservation efforts have garnered him awards, accolades, and inductions into halls of fame. 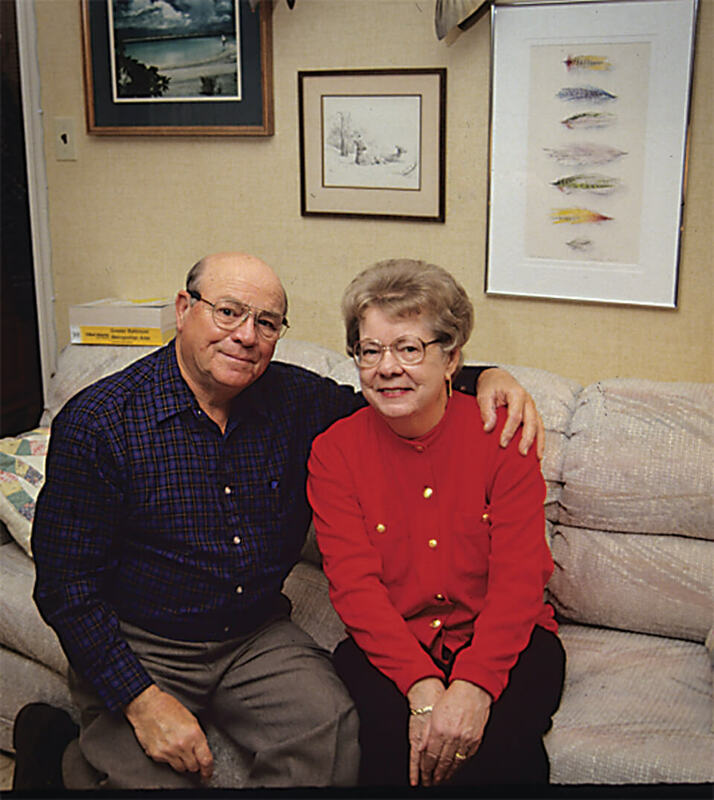 In 2012, Maryland paid homage with the “Lefty Kreh Fishing Trail” along the Gunpowder River. Lefty casts on Conewago Creek in Pennsylvania. But at 91 years, pacemaker and shoddy knees be damned, Lefty’s not slowing down anytime soon. Today he’s finishing up this fishing lesson with me, and tomorrow he’s off to Dallas or the Bahamas. South Carolina or Massachusetts or Montana after that. The calendar that hangs in his home office amidst old photographs and fly boxes only has a few free days this month. His inbox has 103 unread emails. And today, out here, this afternoon, beneath the oak trees and afternoon light, Lefty is the same young man you’d find fishing the banks of the Monocacy three-quarters of a century ago on a full-moon, summer’s night. The rod rests in his hand as if he were born with it, and the line unrolls with a weightless grace, like he’d summoned it to do so. He still makes mistakes, but he knows that, with each motion, you’re only as good as your desire to be better. So he’ll be out there till the cows come home, because, retire? For the boy who started working at age 6. Quit? For the man who made it through depression and war, who changed the face of fly-fishing as we know it, and who, like a “bumble bee in a ball jar,” needs to always be doing something. 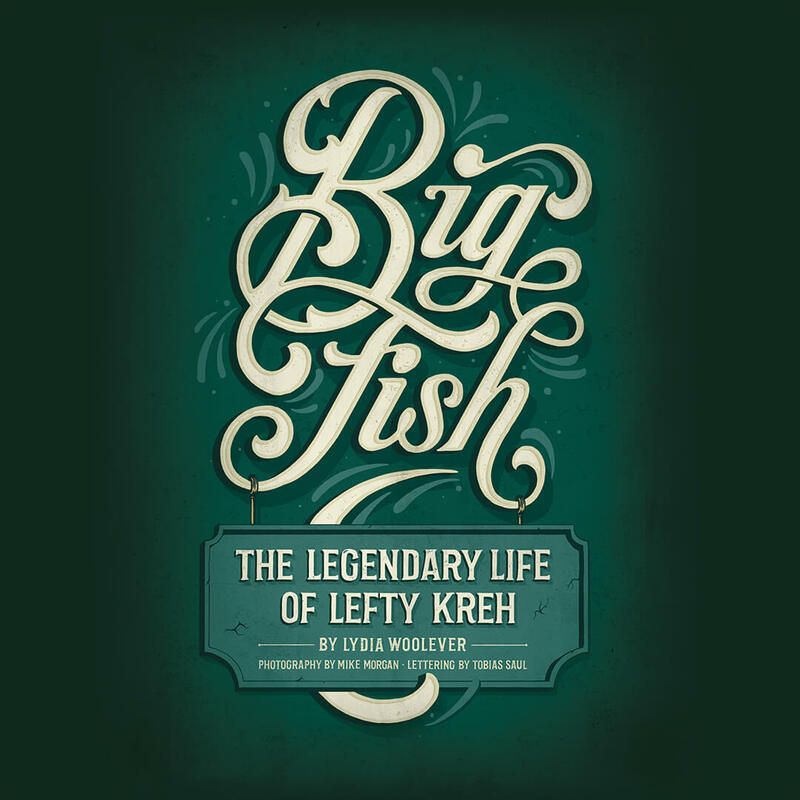 Lefty talks technique and shares stories from his legendary life. —Video by Justine Hulsey and Meredith Herzing.